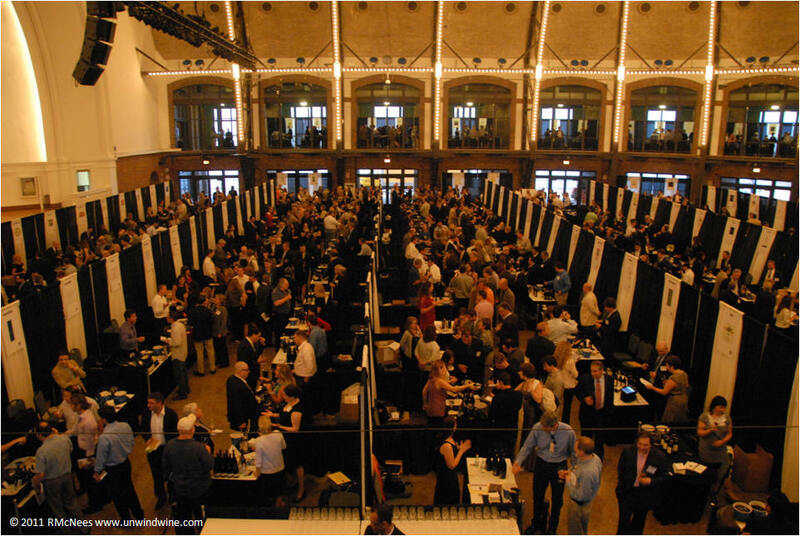 Admittedly, we were a bit disappointed when we saw the final roster and floorplan for Wine Spectator's Grand Tour Chicago. Absent were any first growth, super second or other premiere Bordeaux producers which tend to be the feature highlights of our interest. As customary, we select our target tasting preferences ahead of time and then lay out our plan of attack according to the floor layout. 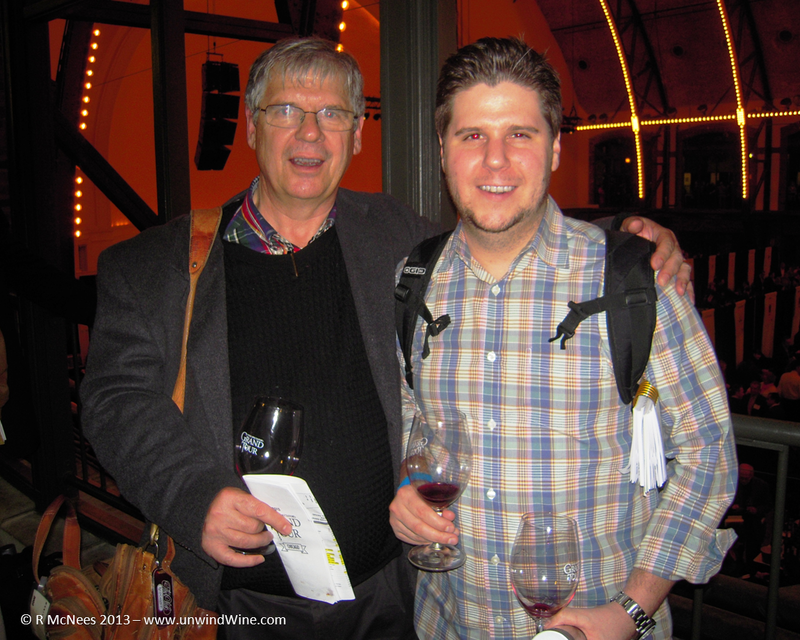 Our consensus target list featured twenty five wines with another dozen possible entries. Naturally this is about our limit anyway, both in terms of timing and in the tolerance of our pallets before they succumb to 'fatigue' or overload. Never-the-less, as always, Grand Tour was a resounding success based on a cadre of returning favorites, new discoveries of emerging labels from known producers as well as discovery of some here-to-for unknown producers. Our wine crew consisted of the usual suspects, members of our OTBN group, sans Ernie and Eric, both of whom were in California for separate conflicts - Eric and Cathy's first grand-daughter, JJ, and Ernie's business conflict. So, helping me hold down the fort were Bill C, Dr. Dan, #1 son Ryan, Lyle and John B. We met beforehand at Flemings Steakhouse in Chicago's River North neighborhood to review our tasting route and solicit any last minute targets. Indeed, a couple such entries turned out to be some of the surprise discoveries of the evening. With small plates dinner at Flemings, we drank a bottle of Ladera Napa Valley Cabernet Sauvignon 2009. We discovered this wine during our visit to the winery during our Napa Valley Howell Mountain Wine Experience - Ladera back in 2008. Fruit for Ladera Napa Valley Cabernet Sauvignon is sourced from Ladera estate vineyard blocks on their historic Howell Mountain property, a blend of 97% Cabernet Sauvignon and 3% Petite Verdot that was aged in 40% new French oak for 20 months. As Bill C noted, this is a benchmark favorite Napa Cabernet that can be found many restaurant winelists at a very reasonable QPR. 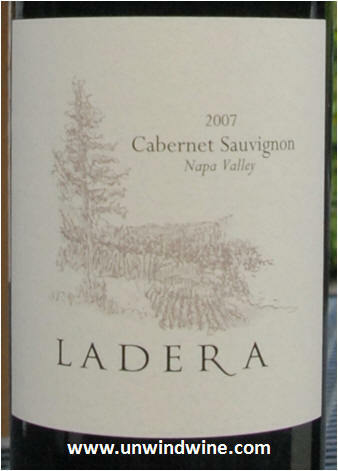 The 2009 Ladera Napa Valley Cabernet Sauvignon is easy drinking, nicely balanced, medium to full bodied with full flavors of black berry, black cherry and ripe plum fruits with notes of cedar, anise, sweet oak spice and ripe tannins that linger on a long velvety finish. At the Grand Tour, our approach allows us a basis for comparison on known benchmark wines against new discoveries, as well providing a background for our vintage tasting reviews. We allow room for experimentation and exploration, but our view is that without adherence to a plan, the vast selection and diversity of the overall event, can be overwhelming and lead to getting lost and leave the potential for missing some key target selections. This year, the slimmer list of targets allowed for more wandering and exploration, but our adherence to our plan ensured that we did indeed get through and address our priority list. The result was a typical Grand Tour with spectacular wines, a vast selection and numerous new discoveries, expanding our horizons and wine knowledge and pallet 'vocabulary'. Initial stream of consciousness from memory before I refer back to my notes. Based on the composition of our cellar collections and purchase profiles, we focused on Napa Valley Cabernets, Bordeaux, then Australian Shiraz. 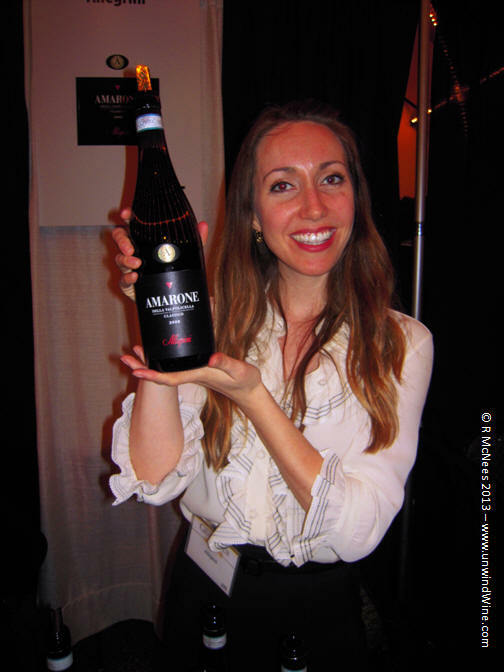 We also ventured into and explored emerging new world entries entries mostly from Argentina and Chile and tapped into the Italian aisle which culminated in Ryan discovering Amarone - one of the highlights of the evening. 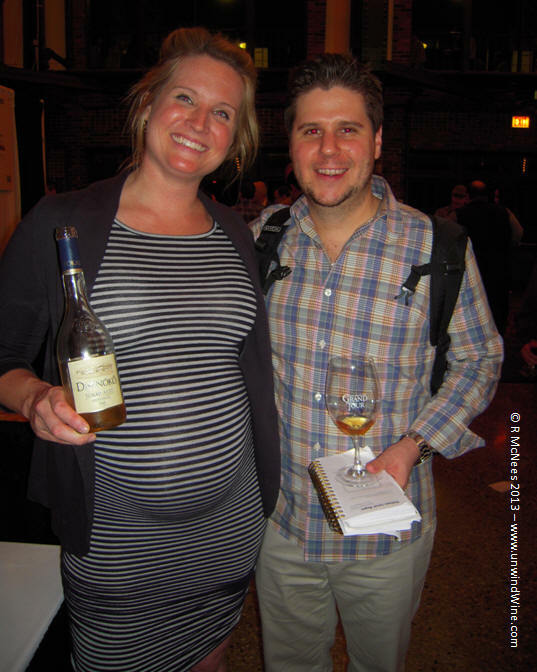 We closed the evening checking in to the 'stickies', desert wines from Sauterne and Tokaji. Lyle, who is our conscious and sentry for ports waved us off the Port aisle citing uninspiring results from his advanced foray there. A regular at recent Grand Tours, this year's 2010 release was a blockbuster highlight of the evening - awesome, big, full bodied, firm gripping backbone yet superbly balanced symphony of complex fruit flavors. Picture from the 2011 Grand Tour Chicago report. Naturally on our wine budgets, these are not every day or even once a month drinking wines, but we do collect Special Selection in our cellar for special occasion wines - most notably from the 1990 vintage from son Alec's birth year - which was also Wine Spectator's Wine of the Year, hence this is a must have in our collection. Results of tonight's tasting suggest the 2010 is a must purchase as we're looking for this vintage collectables to commemorate Lucy, our first grand-daughter's birth year. Indeed our large format collection of birth year wines was the subject when our cellar was featured in the Collector column of Wine Spectator back in June 2001. 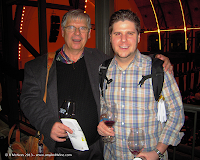 We discovered Cliff Lede and Poetry at the Grand Tour Chicago 2009 when it was one of the standouts of that event. We followed with a visit to the winery during our Napa Valley Wine Experience, Cliff Lede Stag's Leap District Vineyard & Winery Visit - Autumn '09 and Cliff Lede has been a staple of our cellars ever since. This Poetry was big. firm forward fruit with backbone of firm tannins - brambly black fruits with charcoal turning to mocha on a long lingering finish. Surprise discovery from this well known and popular producer - only 175 were cases produced of this special vineyard designated bottling. Of the eighteen tons of grapes harvested from the prestigious Beckstoffer To Kalon Vineyard, the most select two tons were used in this premiere blend. Smooth, polished, superbly balanced with moderate tannin backbone, black fruits turn to layer of mocha, mineral and floral on the smooth finish. Bill and Dan loved this and till take what they can obtain! Benchmark perfection from this perennial premium offering - superbly balanced, polished, complex, approachable already but firm tannin backbone ensures long life and cellaring improvement. Another undiscovered label from a well known producer this Reserve is sourced from low yields from old vines planted back in 1972 and 5% Merlot, both from their Cold Creek Vineyard, with 6% Cabernet from their Canoe Ridge Vineyard, also well known due its single vineyard designated labels.Full bodied, firm well extracted complex fruit flavors with nicely integrated polished tannins. 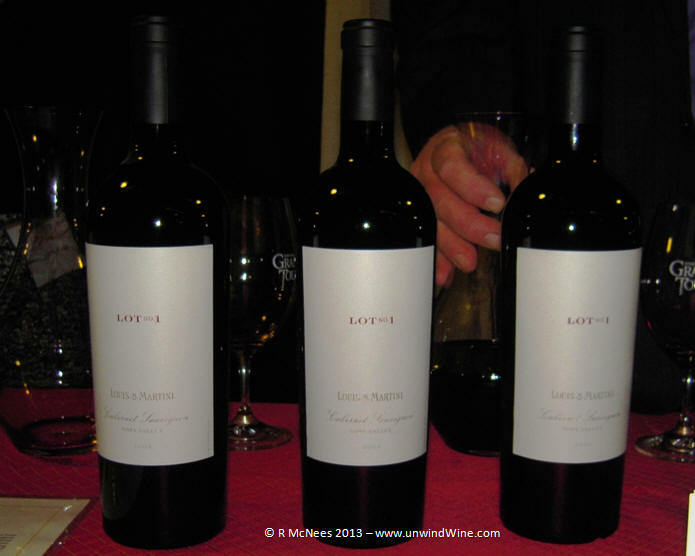 Consistent with recent tasting at the winery just two weeks ago during our Napa Valley Wine Experience 2013. A bit lighter and less complex than recent vintages leaving a bit to be desired in this flagship from this high profile producers. Not as big as the blockbusters above, a bit less complex but nicely polished and balanced stable cab. Less weight and complexity than the big dawgs above, nicely balanced and polished but lacking the grip and muscle of the big hitters. A surprise discovery of the evening - we had this on our target tasting list. We learned of the work going on at Round Pond during our visit to neighboring Honig Vineyards during our recent Napa Valley Experience 2013. It lived up to expectations or more, none were disappointed. Full bodied, nicely structured with firm backbone, black berry fruits with layer of mocha, anise and hints of olive and faint eucalyptus on the finish. Great QPR in this high-achieving previously overlooked label. RM 91 points. From property owned by legendary E&J Gallo, crafted by winemaker Louis Martini, another surprise discovery of the evening with an interesting blend from Pritchard Hill, Atlas Peak Stagecoach vineyard and Napa Valley fruit. A big complex dark wine, lacking the polish and balance of some of the others, but a high achievement from this well known but here-to-for underachieving or overlooked producer. We did a drive-by during our Mt Veeder Napa Valley Wine Experience in 2011 as we focused on meeting new boutique producers on the mountain. 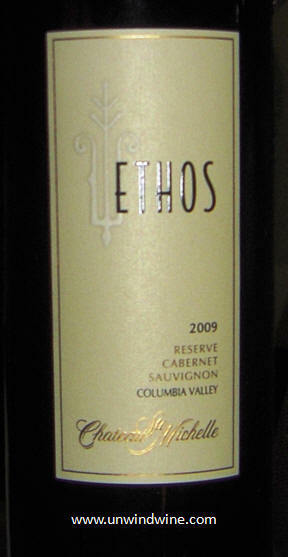 That was was the decision since this 2008.release Cabernet would've likely been on the tasting menu. This actually exceeded my expectations with nicely integrated tannins on the smooth drinking balanced black fruits. This probably provides reasonable QPR for the area. A bit less polished and balanced relative to some earlier highlights, this was a bit awkward and obtuse with some forward black fruits and some gripping tannins, but lacking balance or polish of some of the high achieving efforts. Hard to believe this is from Canada. 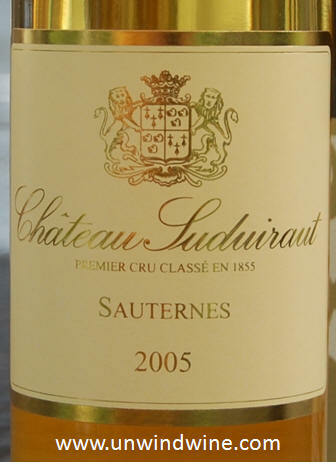 The producer says their latitude results in long summer sun days providing ideal conditions for Bordeaux varietal grapes. 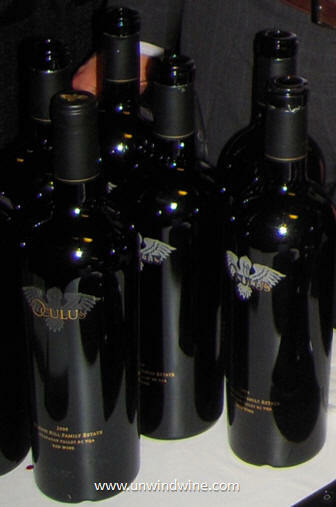 From the Canadian region known for desert wines, Oculus is Mission Hill Family Estate's Bordeaux inspired flagship wine from the Okanagan Valley in British Columbia. 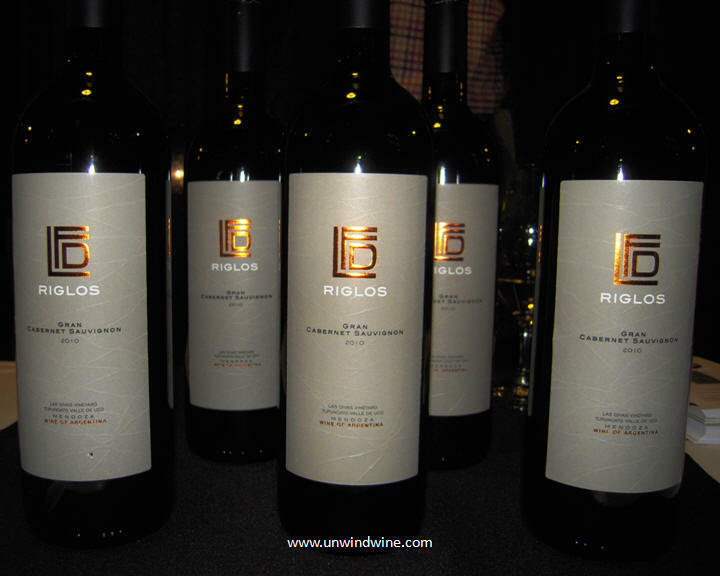 Blended from select clusters of designated blocks in the estate Osoyoos and Oliver vineyards; 50% Merlot, 30% Cabernet Sauvignon, 15% Cabernet Franc and 5% Petit Verdot. Medium to full bodied, dark inky color, black berry and black currant and plum fruits, anise and coffee bean with tight tannins on the finish. 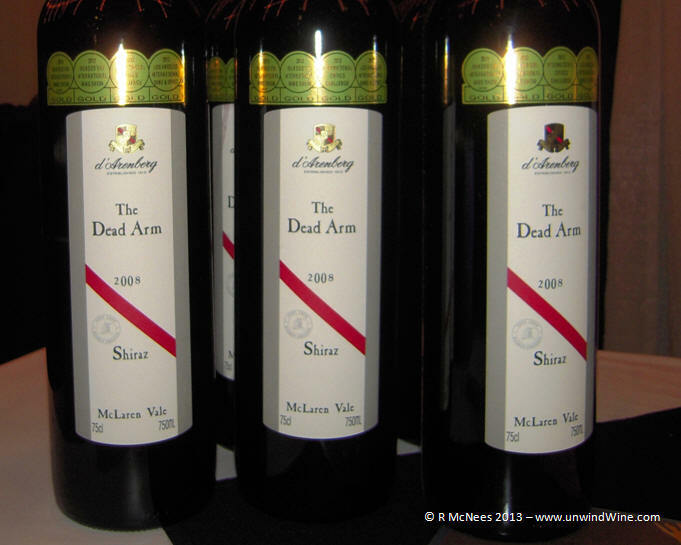 We discovered Dead Arm back in the nineties and have collected and sourced this regularly for our cellar and for friends. We hold a vertical wine that goes back to the 1994 vintage so we're big fans of this label. It seems that they've lost their way at times as this vintage release seemed uninspiring and lacked the rich concentrated fruit that we've come to expect in Aussie Shiraz' at this pricepoint. Perhaps its pallet fatigue as we reached here at the end of a long evening. When I read the winemaker's notes on this release, it opens with "notes of fennel", and continues '".... purple flowers and blossom mingling with ripe, varietal purple fruits and black pepper, dried herbs, game and spice. The palate opens with anise, black pepper, graphite and restrained dark cherries before it gives way to seductive mulberry, plum, licorice and spice. 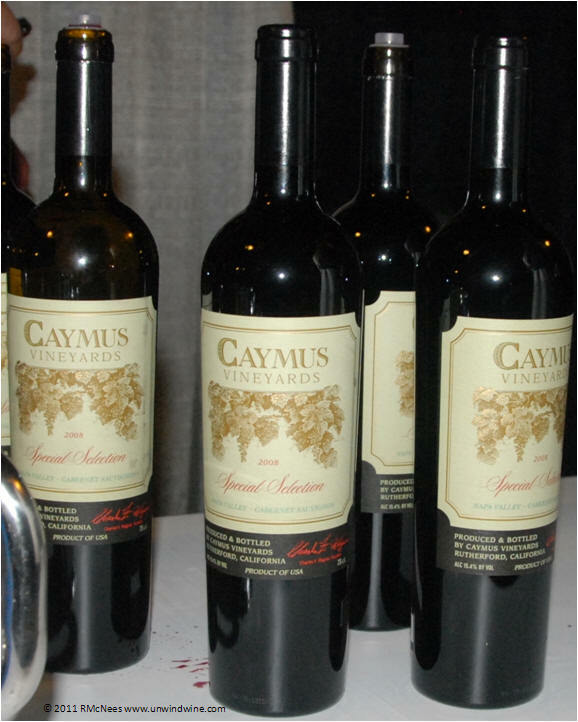 It has great power, depth and length with very vibrant, gritty fruit tannins providing immense structure." I read into that fennel, opens with pepper, graphite and anise, and then it refers to 'restrained' dark cherries, "before it gives way" to seductive plum. These wine reviews are cryptic and confusing enough but over time one learns to decode and translate them to recognize the vocabulary that matches one's personal tastes and preferences. When I read this one, its logical and consistent with my personal perception - more subdued fruit accompanied by several tones that I personally don't favor that end up competing with and therefore detracting from the fruit. Perhaps this warrants another tasting, standalone, and without the inevitable pallet fatigue of the end of Grand Tour event. Our discussion with the supplier cleared up some of our label confusion with these wines. 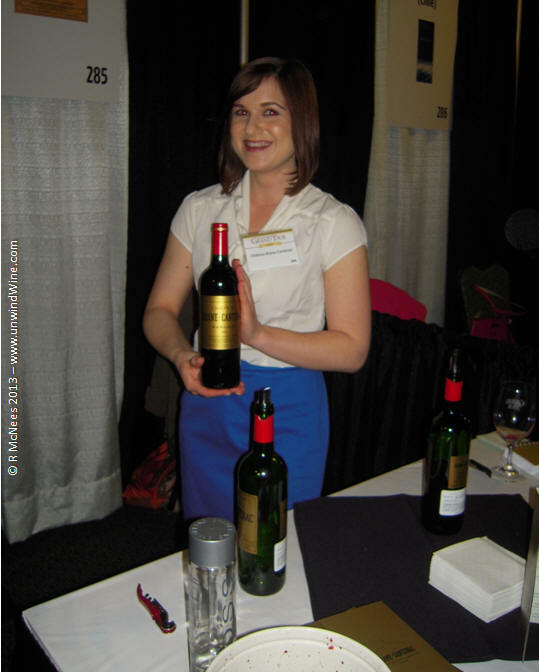 The flagship top of the line label remains Amon Ra which has received blockbuster high marks for the 2010 vintage. We hold several vintages of the Glaetzer Godolphin label but we have not seen it in recent releases. We learned tonight this label was discontinued due to trademark issues and has been replaced by this 'Bishop' label, named for Colin Glaetzer's wife Judith's family. Their Anneparena rounds out the Shiraz family. 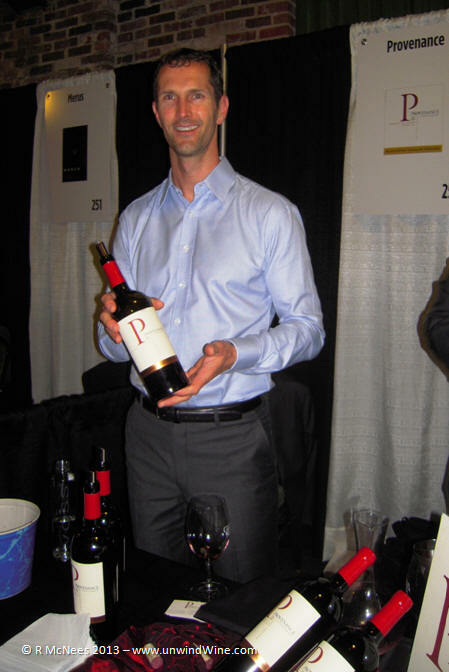 The Wallace label is their Grenache varietal offering. These continue to represent full-throttle flavorful Shiraz offerings. 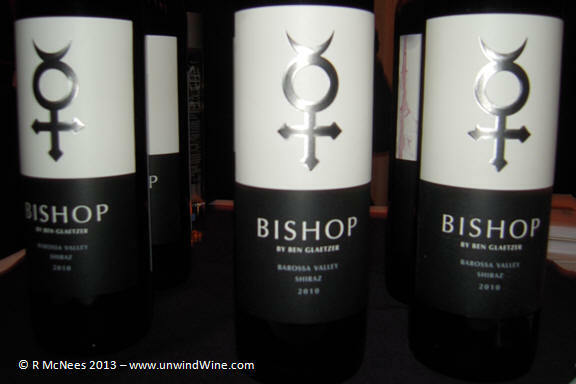 The 2010 Bishop was full bodied, inky purple colored, forward tongue-coating blackberry and mulberry fruits turning to a layer of anise and floral on the full lingering tanning finish. Dense, full bodied, deep concentrated complex black and blue berry and cherry flavors accented by spice, well integrated, soft silky nicely polished tannins on a long finish. Two Hands is a bit of an enigma here in Chicago. While we have occasional varied labels from the Two Hands brand in our cellar, their plethora of single vineyard designated labels can be intimidating if not overwhelming. If a passionate Shiraz zealot like me feels it, the average 'normal' consumer surely must do so as well. This condition is perhaps exacerbated by their premium pricepoint since we've found may high quality highly rated options that offer high value QPR. Perhaps the fact that they lack distribution here in Chicagoland, or are not apparent in the stores we shop, we've not become familiar or knowledgeable in their brand. 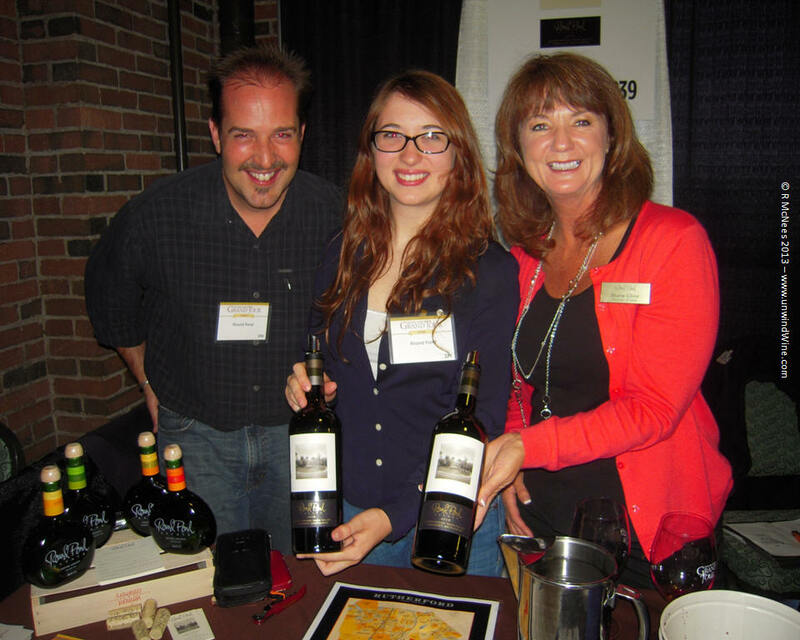 Our exposure to Two Hands is at Total Wine on the east coast when we travel there. That said, they're most likely available in our market somewhere but we haven't seen it - and we do a lot of wine shopping. But then, that's what the Grand Tour is all about - to gain exposure to new brands and labels in the marketplace. So many wines, so little time (and money), Two Hands offers a ripe field for further discovery. 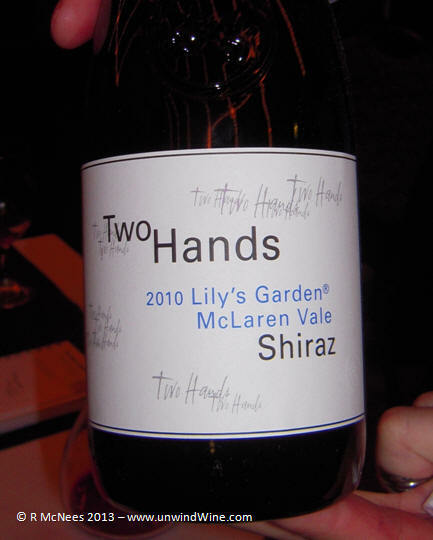 This 2010 Lily's Garden was full bodied, forward black berry fruits with tones of mocha, spice and hint of pepper on the lingering finish. Golden honey colored, full bodied, thick heavy sweet nectar of apricot, hint of peach and layer of creme caramel on the tongue coating finish. The Disznoko estate is situated at the south-west entrance of the Tokaj region, about 250km from Budapest. Although Disznoko produces a number of wines, the aszu harvest is considered the most important. The most time-consuming and labor-intensive part of the vintage is the hand-harvesting of the aszu grapes, which are the shriveled grapes affected by noble rot that have dried on the vine-stock. 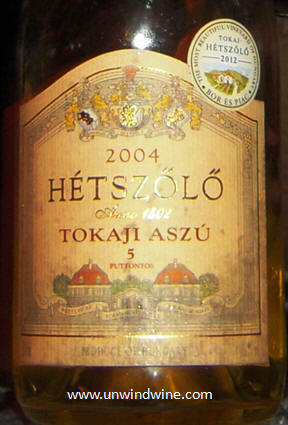 Disznoko Tokaji Aszu 5 Puttonyos is a blend of Furmint, Harslevelu and Zeta aszu grapes. This golden colored with full body and forward fruit flavors of peach and lemon with tones of honey, tropical fruit and mineral on the long finish. Golden orange weak tea colored, medium full bodied, modest apricot fruit accented by a layer of smoke and nut with hints of honey on the lingering finish. Medium bodied, moderate black berry and black cherry fruit with a layer of cedar, tobacco, leather and spice with a moderate oak finish. 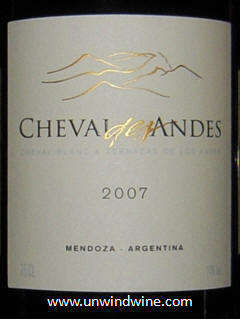 This 2007 Cheval des Andes is a blend of 60% Cabernet Sauvignon, 35% Malbec, 4% Merlot and 1% Petit Verdot, aged for 18 months in oak. Riglos is named after the Argentinean town from which producers' Dario Werthein’s and Fabian Suffern’s grandparents came. All the fruit is sourced from the estate in the Uco Valley, Mendoza. Dark purple colored, full bodied, intense and firmly structured with earthy blackberry, hints of licorice, pepper, cedar and graphite detract from the fruit leaving it a bit obtuse. 100% Cabernet that spent 20 months in new French oak. 15.4% alcohol.